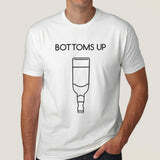 Bottoms up t-shirt. Are you used to toping drinks as soon as they are served, be proud about your super power. Most people will take forever to drink a peg and so be boastful about being a badass drinker.